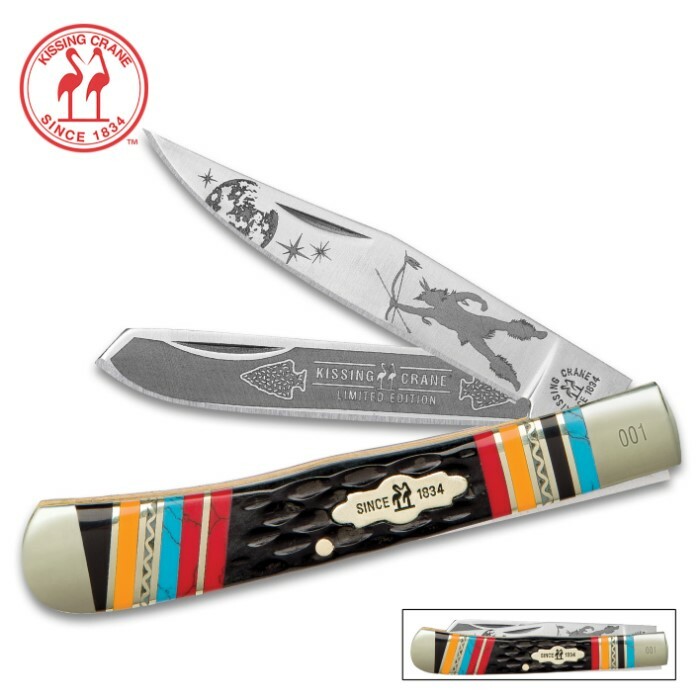 Kissing Crane Warrior Moon Trapper Pocket Knife / Folder - Collectible Limited Edition, Native American Theme, Serialized Bolsters - 440 Stainless Steel Clip, Spey; Laser Etched American Indian Art | BUDK.com - Knives & Swords At The Lowest Prices! Teeming with color, beauty, strength and life, Kissing Crane's "Warrior Moon" Pocket Knife series echoes the hard-fighting spirit and rich cultural kaleidoscope of our first nations - the true founding fathers of America. Native Americans may share common ancestral roots, but each tribe is very much a unique people, with customs and identity all their own. Similarly, these limited edition folders feature familiar, traditional forms, but their vibrant style and bold appointments are unparalleled - set apart from all other knives. 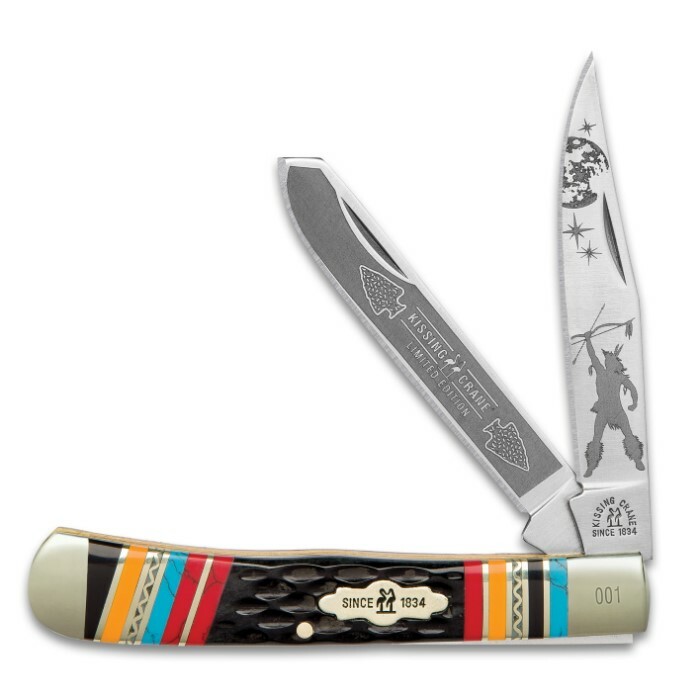 Take the trapper - this tried-and-true pocket knife design is a longtime bladecraft staple. And for good reason! Trappers are ideally sized and exceedingly versatile - big enough to tackle a wide range of cutting tasks yet small enough to fit comfortably in jeans pockets for everyday carry. But the Warrior Moon is unlike any other trapper. 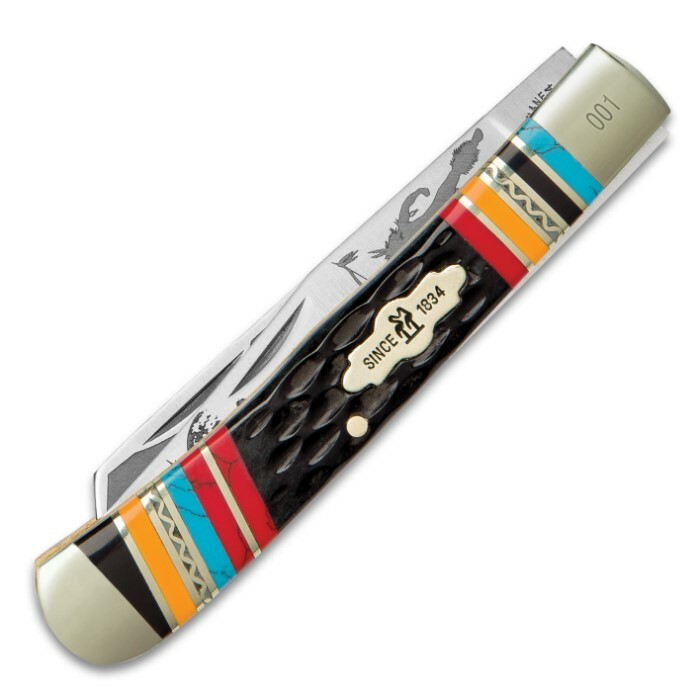 Breathtaking, superbly detailed laser etchings adorn both the clip and spey blades, depicting arrowheads, Kissing Crane Limited Edition art and an indigenous warrior motif. Raising his bow toward the heavens - in triumph, perhaps - the lone native archer stands resolutely beneath a crater-scarred moon and twinkling stars. Every bit as bewitching as the blades, the Warrior Moon handle is a stunning dreamscape of brilliant color and delicate texture, comprised of stone, resin and jigged bone scales. Stately brass spacers intersect the contrasting handle scales, bookended by nickel silver bolsters. There's no question - Kissing Crane's Warrior Moon Pocket Knives are in a class all their own. Furthermore, every individual knife in the series is one-of-a-kind, with serialized bolsters denoting each Warrior Moon's place in this extremely limited run. A collector's dream, the Warrior Moon Trapper looks fantastic on display - on its own or accompanied by its Warrior Moon brethren, the stockman, stiletto and pocket farmer. It's an eye-catching, show-stopping must-have in any cutlery or American Indian art collection. Don't miss this rare opportunity to own one of these outstanding limited edition bladed gems!